Perfect for use in libraries, schools or any work area with a large collection of books. All-steel construction with unique hole pattern design is accented by tubular steel legs. Oversized casters for easy maneuverability. Black powder coat finish for durability. Three 8\ deep slanted shelves on each side of cart. 12\" clearance between shelves. Includes a height-adjustable file pocket. 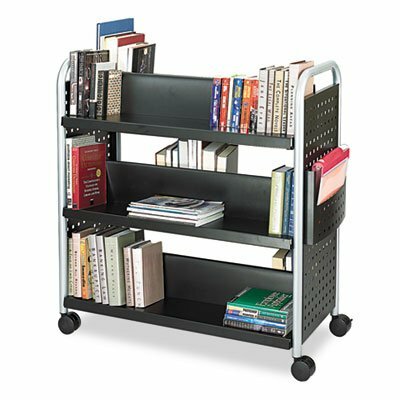 Color: Black; Caster/Glide/Wheel: Four Oversized Casters; Material(s): Steel; Overall Width: 41 1/4\"."